Pope Francis on August 26, 2018, spoke of the faith in the face of suffering he found in Ireland while declining to comment on allegations made by a former Apostolic Nuncio to the United States. His remarks came to reporters during an in-flight press conference as he returned from Dublin to Rome. They were reported in Vatican News. 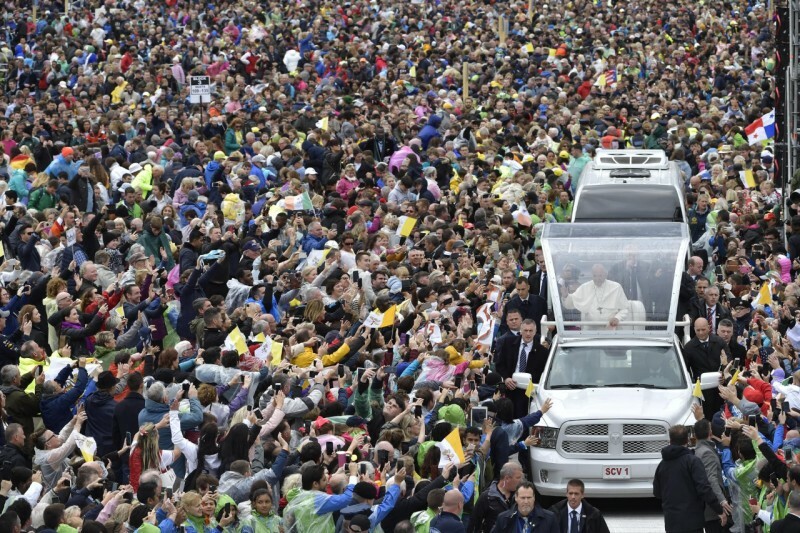 The Holy Father was in Ireland on August 25-26, 2018, to participate in the World Meeting of Families. He participated in numerous events in Dublin and Knock. While the planned events were a joyful celebration of family, the issue of the abuse scandal arose on several occasions, with Pope Francis acknowledging the failures of Church leaders, apologizing, and pledging change. He noted that the healing process continues, but the faith of the Irish people remains solid. Abuse was front-of-mind among many in Ireland, both because of the recent resignation of Archbishop Theodore McCarrick after the finding of credible abuse allegations, as well as the release of the Pennsylvania Grand Jury Report on abuse in six dioceses. The abuse issue received heightened attention by the release of a letter late evening of August 25, 2018, by a former Apostolic Nuncio to the United States. In the letter, Archbishop Carlo Maria Viganò questioned the Holy Father’s response to accusations against Archbishop Theodore McCarrick, and other senior Church officials. However, the Pope spoke on a number of subjects, including how to try a Bishop accused of abuse. Gently rejecting the wish of Marie Collins – a former member of the Pontifical Commission for the Protection of Minors – the Pope said that a standing court such as the one called for in the motu proprio“Come una madre amorevole” is not the best option. Rather, Bishops might be tried by an ad hoc tribunal on a case by case basis. “It functions better that way,” the Pope said, citing the trial of the Archbishop of Guam. He also indicated another trial was proceeding along the same lines. Pope Francis praised the Irish minister who spoke about the tragic case of orphanages run by Irish nuns in Tuam—the subject of an investigation by the authorities into abuses that occurred over many decades. The Holy Father urged caution until the investigation could be completed, and the responsibility of the Church could be determined. A journalist asked Pope Francis what advice he would give to a father whose child revealed that he or she was homosexual. The Holy Father said he would encourage a parent “to pray, to not condemn, to dialogue, to make room” for their son or daughter—because to ignore them or cast them aside would mean something was missing from their parenthood.